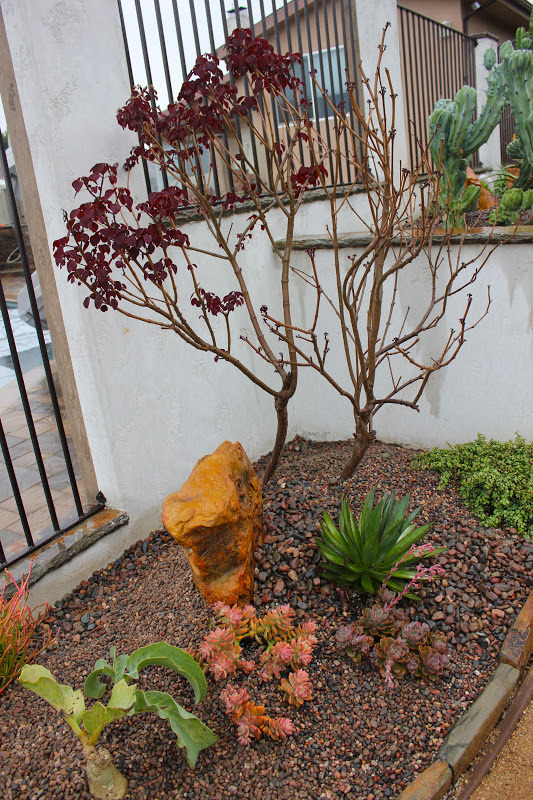 DEETER BUCKNER DESIGN, LLC: The Final Days of Installation of An Exquisite 'Destination Garden' in Palos Verdes!! 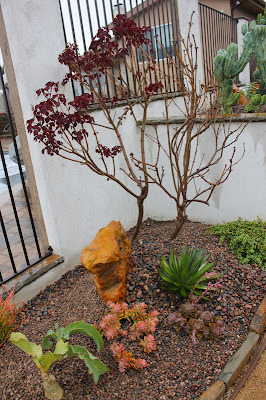 The Final Days of Installation of An Exquisite 'Destination Garden' in Palos Verdes!! 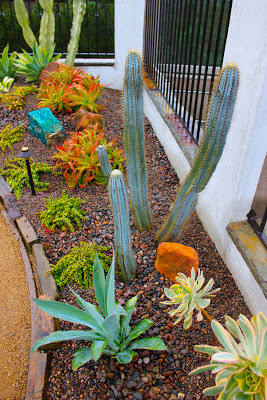 Here's a collection of images from the amazing & dynamic Palos Verdes Destination Garden that we finished installing this past week! I'm going to start this post with some 'before' images, then intersperse those with 'after' images from the final 2 days of installation. I'll be back to add text...work calls, so I'm out the door...ENJOY!! 'Before' - 2nd level garden area. An 'after' image - a high wide angle view of this uniquely original destination garden in the hills above L.A. - poetic, inspirational, w/jewel-like areas...gorgeous, inviting. 'Before' - 3rd level garden area...much work to come. 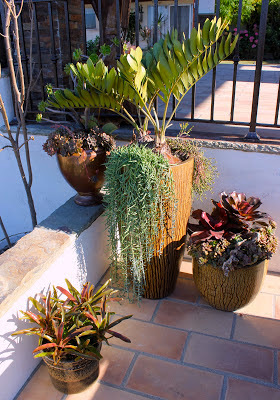 I adore the 'golden barrel garden room tableau'. 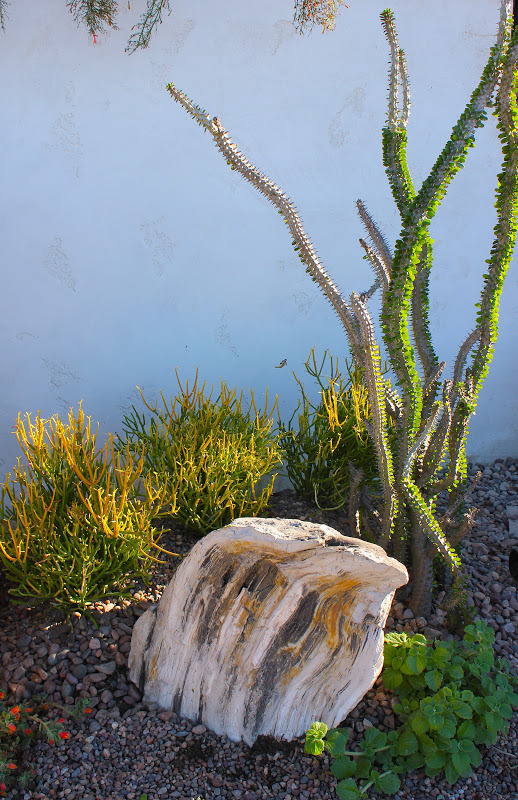 Note the elements added to this area since my first post: a stunning, rare piece of petrified wood (upper-right corner) and a fabulous authentic metate (mid-left). What's not to love? 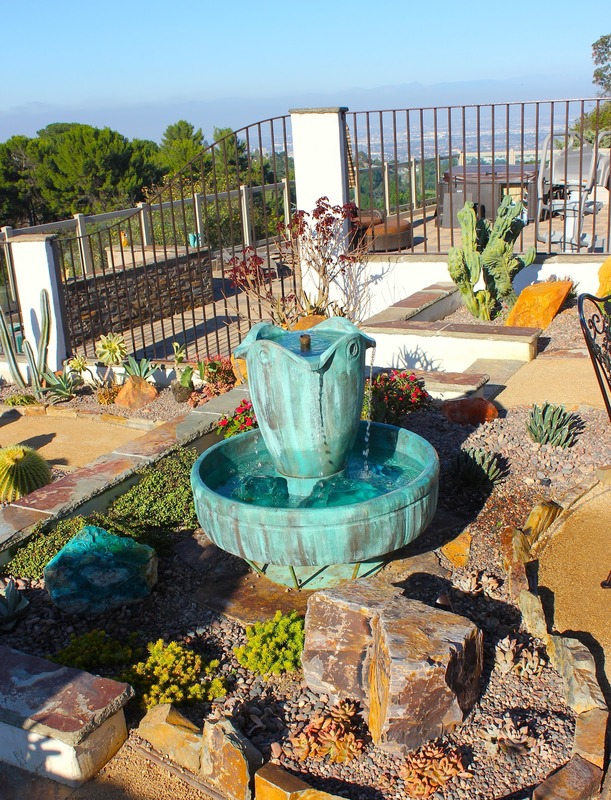 Gracefully articulated, beautifully designed garden areas, with an amazing backdrop - Southern California's picturesque skies framing an expansive view of the valley below...a destination garden with a view. The re-structuring of this garden wall and a bit of artistic acid-washing begins. And 'after'...It began to rain in the afternoon of the final day of installation. 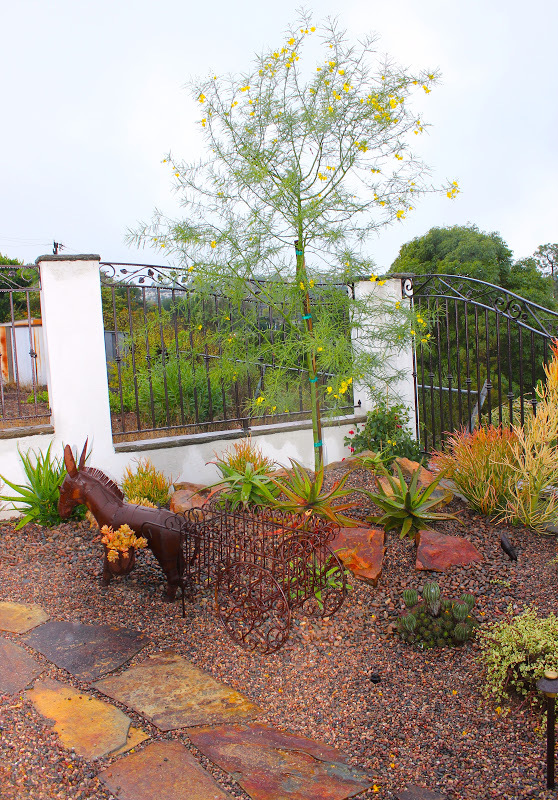 The wet surfaces, of both the hardscape and softscape, responded to the rain by highlighting the already dynamic colors present in the landscape and the sculptures - thank you Mother Nature for the rain! Tableau vivant! I adore this shot...the burrow is seemingly captivated by the musician's "ability to entertainment". This image also represents how the sum of the parts (3 separate tableaus) can equal a very creative whole (overall larger tableau setting). 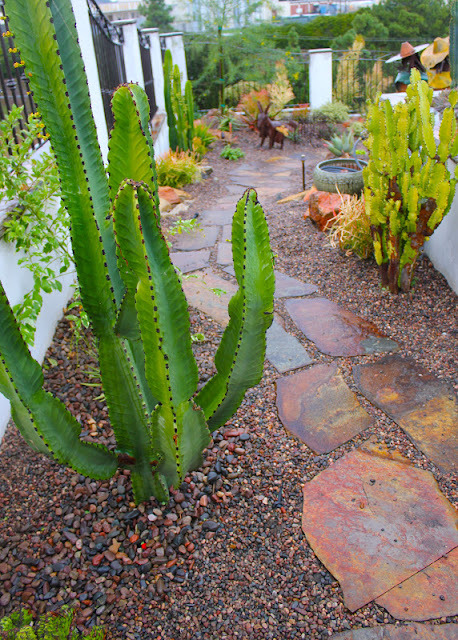 'Before' pathway to the lower level garden path that loops past the front of the Palo Verde tree, behind the musicians, and out into the main garden areas with a view of the valley. An 'after' of the same pathway - now an 'inviting visual and physical trip' to the garden below. The Palos Verdes tree tableau. Naturally. 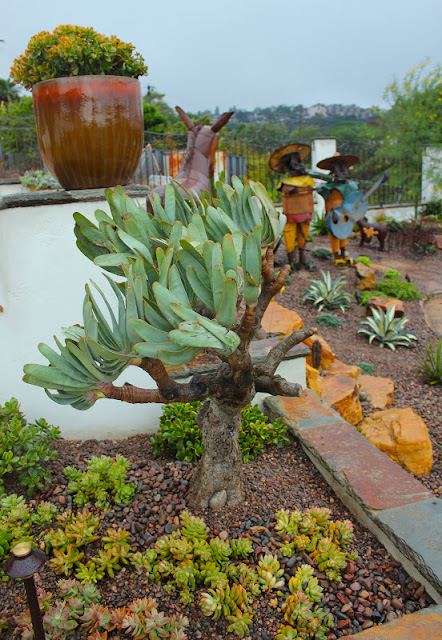 The Euphorbia continifolia is a colorful small tree, perfect for water-wise gardens - this tree will grow to about 15' high and 5-6' wide, it's drought tolerant with a minimal root system - no fear of invasive roots here. The 'blue garden'. A must in the coastal hills of P.V. We are, all of us, living in a desert that borders the ocean. This garden reflects that relationship beautifully. Sweet. Standing here in the morning light one is struck with the presence of both the newly installed landscape and the area itself - the rolling hills of Palos Verdes with the valley in the distance. Feels amazing - a visually stimulating space in any light. 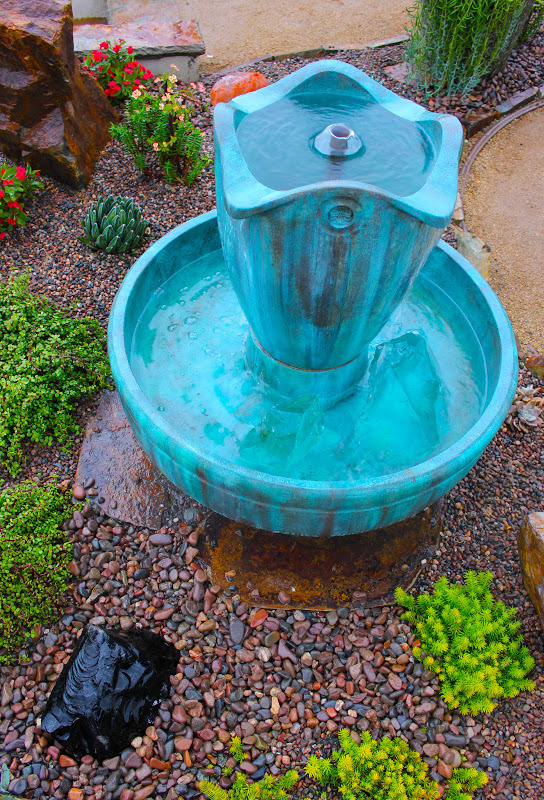 A visual transformation of the fountain was accomplished by an artistic application of a patina-wash and some additional height which was provided by a newly designed metal pedestal (the pedestal/base was designed & welded together by the owner's daughter. You rock 'little sissta'!). Note the large pieces of glass added to the fountain's water basin (a shade of turquoise) and the large piece of dark glass added to decorative gravel. This area is now a visual magnet! This cactus has bloomed at least 2 x since we started the installation - it's obviously quite happy with its new home. 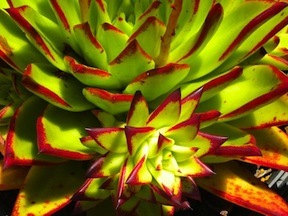 The garden also includes some 13 original container gardens!! Note: this rock is not acid-washed, it is a naturally occurring turquoise-colored mineral!! This jewel-like planting area is a distinctive 'color-echoing' companion to other turquoise-colored elements installed throughout the garden levels. An inspiring, poetic space. This image speaks for itself...or one could say, "..to the eyes of the man of imagination, Nature is imagination itself." Which famous male poet said that? William Blake, of course. Rain falling on inherently colorful materials = great photo ops for me on this final day of installation! Do you know what type of rock this is? I hadn't seen one like it before until we did some research, made a 'search and destroy' drive to locate it, and brought it back, just for this job. A rare piece of petrified wood from a burned forest area in Utah, makes an original, elegant and gorgeous addition to the garden. This photo taken from the gardens 1st level provides a view of the sweeping graceful movement and dynamic color-echoing throughout the garden. It's hard to believe this garden was 'just installed' - imagine what it will look like in just a year's time. It's already a breath-taking, creative lifestyle back drop and a dynamic, provocative space for future entertaining. The crew 'working in the rain'. Prior to this we were busy seeking out the necessary rain gear wherever we could find it - whether it fit properly or not, it was welcome protection during the final hours of installation. These guys are true artisans, and the patina-washed container garden that follows is yet another example of their artistic abilities. Another original in the garden - an elegant, patina-washed container - designed just for this garden. Cool.